For the purposes of this example, we will be using a maximum of 15000 pages. 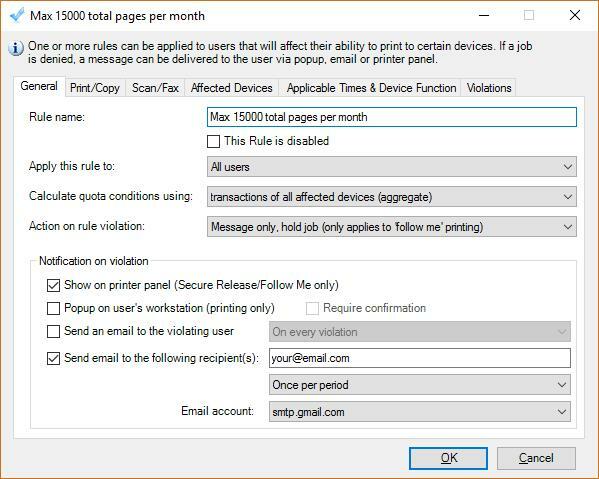 In the Rule name text box, under the General tab, enter Max 15000 total pages per month. Change the Apply this rule to drop down to All users. Change the Calculate quota conditions using drop down to transactions of all affected devices (aggregate). Change the Action on rule violation to Message only, hold job (only applies to ‘follow me’ printing). Tick the Show on printer panel (Secure Release/Follow Me only) checkbox. If you want to get an email when the threshold is met, tick the Send email to the following recipient(s) checkbox and enter your email address. In the drop down below your email address, change the option to Once per period (so you only get one email). Choose the email account that will be used to send emails. Select the Allow printing on the selected devices based on the following conditions option. On the All Printing tab, select the Max number of pages option. Enter 15000 in the box. Change the Effective period drop down to per calendar month. Change the Message if violated to This printer has reached its maximum threshold. Please release your job at the upstairs printer (put in whatever message you want the user to see). Change the option to Only the devices selected below. Tick only the printer for which this maximum threshold will apply in the list below.